Having to work in urban societies – in the city, among buildings, traffic, people, parking, congestion, smoke and smog really takes a toll on one’s body and mind. Sometimes we really need to go to a place of peace, healing and recovery. Because of this, I conceptualised and founded Kechara Forest Retreat with my close members and since then, it has grown and we are still in the process of building Phase 1 and Phase 2. What is beautiful is that at the entrance of Kechara Forest Retreat, we have a set of flag poles with three flags displayed. The centre which is the most prominent and most respectful position is adorned by the Malaysian flag. This represents our love, our loyalty, our appreciation and our respect towards our country and where we are, Malaysia. May Malaysia always grow, always be at peace, harmonious and prosperous. We wish the best to all our Malaysian people, the government and the public. The second flag, on the left, which is the second highest position of respect, is the flag of Pahang state. 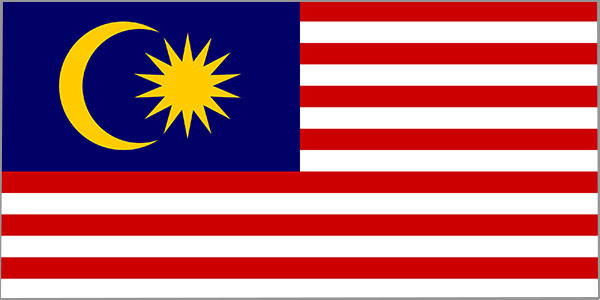 Malaysia has 13 states, and each state has its own flag. So, on the left is a flag representing the state that Kechara Forest Retreat is in, which is Pahang state, and we show our deepest respect, appreciation and love towards the state of Pahang where we abide. For those who are international, Pahang state where we are located is just 45 minutes to an hour’s drive from our national capital of Kuala Lumpur. The third flag, on the right, is the flag of Kechara, which is newly designed by myself. Its white background represents a clean, clear, luminous mind – the mind that has no pollution, no distortions and no projections. The mind is clean, luminous and clear. Therefore it should actually be a clear flag but that is pretty impossible to do, so I put it on a white background representing the clear, luminous mind of enlightenment, of the state of peace and the state of happiness which we strive to achieve. In the centre is the Sanskrit seed syllable of Vajrayogini’s mind. This seed syllable is called the BAM letter. The BAM letter represents Vajrayogini’s mind, which is a Buddha mind, and we wish to achieve the Buddha mind. All of us wish to achieve full enlightenment. So on a clear, luminous mind, we are fully enlightened – that’s the symbology of the flag. At the same time, the BAM represents the conjunction, the smooth operation and the smooth interactions of the four elements of our body. When the four elements of our body: earth, air, water and fire are in conjunction and harmonious, then the mind will be able to generate better thoughts, happier thoughts and spiritual thoughts. The last meaning (in simplicity) for the BAM letter is the dissolution of the elements in our body, the dissolution of our mind and the various states that our mind goes through at the time of death, which equals the next step that is after death (which is bardo), and then rebirth. The BAM letter in subtle Tantric meaning, which I can’t go into detail here, is the dissolution of the gross mind into the subtle mind, and into the stages until you reach the top of the BAM letter where you see a squiggle. So the top of the squiggle and the dissolution of that is the gross mind dissolving into the subtle mind, the subtle mind dissolving and leaving the body, and ejecting it into the bardo, into the future life. So the BAM syllable has that meaning in Tantra, which is according to Vajrayogini’s path. Last but not least, the BAM syllable represents that Kechara is a portal into the mind of Vajrayogini, to become Vajrayogini, and to ascend to Kechara Paradise. Vajrayogini’s paradise is called Kechara in Sanskrit; in Tibetan, it is called Dakpo Kachö. So Kechara is named after the divine paradise of Vajrayogini which we wish all ascend to. Therefore, Kechara’s flag is based on Vajrayogini’s mind and the mind of enlightenment, and the balance of the four elements within our body for peace, harmony and happiness, as well as the mind that is luminous, clear and happy. May all who enter Kechara, who see Kechara, who think of Kechara and has anything to do with Kechara be blessed by all the Buddhas, Bodhisattvas and deities in the form of Vajrayogini. May they reach Her paradise here on earth, and afterwards when they leave the earth. Now that we have our flag poles here and they are in front, we are celebrating, saluting and showing deep respects to our beloved country of Malaysia, our beautiful and beloved state of Pahang, and also to the full mind of enlightenment. Here is a short video that was taken and also a picture, and I want to make a little note that Pastor Moh Mei worked very hard in getting the flags stitched up according to my design, on time for our special event that happened today which you can read on another blogpost. « You want to be fooled? Kechara House bursting with people on Wesak Day! Seeing the Kechara flag in the pictures being flown are indeed wonderful. Flying with our country and state flags paints a thousand words of joy. Glad to come across this old post which explained the meaning behind it. 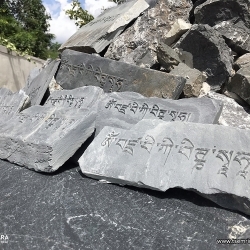 Wow ….so it was designed by Rinpoche , have each stroke of wording and the white background representing the clear, luminous mind of enlightenment, of the state of peace and the state of happiness which we strive to achieve. Beautifully done. Thank you Rinpoche for spending the explanation for the design of the flag which I did not know at all . i am glad i read this old post. 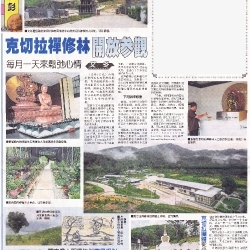 It is important for Kecharian to understand the meaning of the BAM letter; the logo and the symbol used in Kechara’s official correspondences. The BAM letter is the Sanskrit seed syllable of Vajrayogini’s mind, which is the mind of a Buddha. In a simplistic manner, the BAM letter represents the conjunction, the smooth operation and the smooth interactions of the four elements of our body. When the four elements are in harmony, our mind will be generate thoughts that are of better quality. At the time of death, the BAM represent dissolution of the elements in our body, the dissolution of our mind and the various states that our mind goes through at death, at bardo and then rebirth. Thank you Rinpoche for this teaching on the meaning of Sanskrit seed syllable of Vajrayogini’s mind. Thank you Rinpoche for explaining Kechara flag in detailed. May Kechara Forest Retreat keep growing and benefit more people who wants to seek dharma knowledge. We are really fortunate to have such a blessed place and conducive environment for us to practise. May Kechara organisation bring much benefit to all Malaysians, and may the thought to be enlightened and striving for continuous betterment be forever present inMalaysians minds. 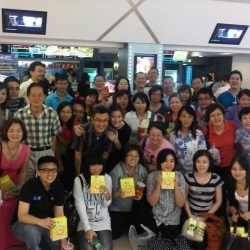 It feel great to know more about Kechara! Thank you, Tsem Rinpoche, for the great information. I love our Kechara flag. It looks very simple, plain, neat and it doesn’t look messy. At the same time, it holds a lot of meanings behind it. When I first saw the white background of our Kechara Flag, I didn’t think or notice many things from it and I have also never thought that it would have so many meanings behind the white background.The mind is clean, clear, luminous mind – the mind that has no pollution, no distortions and no projections. Because the Sanskrit symbol is also our Kechara logo, so I naturally thought that it is just a normal symbol. I have also never put much thought into what does it represent. But now that Rinpoche has explain it so well, I finally understand what it means. 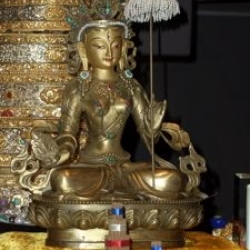 It represents the mind of the Vajrayogini’s mind, which is a Buddha’s mind. The symbol is called BAM. It also represents the perfect mind that we all wish to achieve. A mind where we are able to gain full control of our mind like where, how, when we want to take rebirth and as what. And to be free from all sufferings. In other words, free from Karma. Finally, I want to Thank You Rinpoche for giving us such a wonderful explanation upon the Kechara flag. The meaning behind the flag is beautiful. May every being have the opportunity to reached enlightenment as fast as possible so that no one will have to suffer ever again. Thank you for reading. Thank you Rinpoche for giving us the details and explanation about the BAM syllable, which represents Vajrayogini’s mind that can lead us to attainment and enlightenment. Indeed, we truly appreciate, respect and thankful to our national and Pahang state government to allow us to build Kechara Forest Retreat on this blessed land so that the Dharma can continue to grow, which not only benefit the local folks but the blessings and Dharma can even spread to the people from other countries around the globe. I sincerely pray for Rinpoche’s long life and good health to turn the wheel of Dharma and lead all sentient beings to achieve world peace and ultimate happiness. Thank you for designing and explaining the significance of the Kechara flag. I like the fact that the simple design has a deep meaning behind it. May all reach Vajrayogini’s paradise here on earth, and afterwards when we all leave the earth. Kechara Forest Retreat is certainly a beautiful & holy place that brings the feeling of joy, harmony & peace to the mind everytime that I am there. We are very fortunate & thankful to Rinpoche for choosing our country & the sate of Pahang to build this wonderful & holy centre. Importantly, we are most grateful to the Malaysian Government for their kindness in granting the building of such holy place in this beautiful land, & the Pahang state government for their help & cooperation in making the dream come true. Being a Muslim country, this also symbolise the love, equality & practice of religious freedom by the government towards the people no matter what race, colour & cultural background we are from. Having the 3 flags flying side by side at the entrance of KFR, besides it represent our love & respect to the governments, they will always remind us that with outer peace & harmony we will find inner peace. I wish Rinpoche good health & long life, may Kechara Forest Retreat continue to growth & spread dharma to the ten directions. 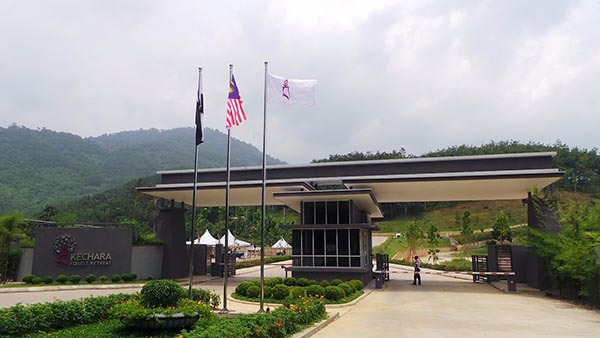 We indeed feel grateful to be able to have our Kechara’s flag flying side by side with our Malaysia’s National flag as well as the State of Pahang flag, at the entrance of Kechara’s Forest Retreat. Our deep heartfelt thanks is hereby expressed to The Government of Malaysia and to Pahang State Government too. May all who enter Kechara, or has any dealing with, see, think or even hears of Kechara be well blessed with good health, a long and peaceful life. May Dharma spread throughout the infinite reaches of space and all sentient beings attain enlightenment quickly. Through the merits of all who have contributed to the spread of the Buddha’s teachings in this respect, and for the sake of all sentient beings, may all their dharma wishes be fulfilled quickly. My deepest hearfelt thanks to Rinpoche for all his endless Dharma inspirations and teachings. Om mani padme hung. I like the simplicity and colour of our Kechara flag. The poles made from stainless steel would last through the test of time. A sight to behold on a windy day our Kechara flag fluttering in the wind next to our national flag and state flag. Every aspect of what we have in Kechara is Dharma. From the functions of the various departments, to the work we do, to our charitable arm; it is all infused with Dharma, and now even the visual sight of a flag can instill such powerful and strong imprints on our mindstreams. That’s what I love..everything Rinpoche does, conceptualises, builds, displays, creates…is all Dharma, for us to learn and for the benefit of others. The Malaysian government and people, as well as the state of Pahang, has been supportive of our works here. Thank you, for embracing us with open arms, and thank you for your kind support. I am proud to be Malaysian, and am fortunate that I live in a country where its citizens are allowed religious freedom and diversity. I am even more fortunate to have entered the portal to Vajrayogini, which is what Kechara is. To be able to practice the Dharma, transform, abandon (or at least lessen) our attachments, self cherishing minds, ego, and all that it results in is one of the best and most permanent things we can do for ourselves and our mind. May all who enter Vajrayogini’s portal through Kechara’s doors be initiated into her practice so that the door to Kechara Paradise opens for us to practice Dharma again and again without distractions. Thank you Rinpoche for the detailed description towards something so profound. Being one with a Buddha, where our minds can be one with the Buddha, means elimination of a self centric mind. Elimination of a self centric mind leads to no suffering for ourselves, and for those around us. In nature, being one with our yidams, male or female, means that we reside in the same state of mind as a Buddha where our existence is not bound by “I” or any identity. We are so fortunate to always be able to walk through the doors of Kechara Forest Retreat; a portal to Vajrayogini’s pureland. A flag is a symbol or emblem of a country or institution or as a decoration during public festivities. Kechara flag is similar to the iconography of a Buddha image that teaches about the path to liberation and enlightenment. The Kechara flag is more than being a mere flag, it carries the very essence of what Kechara is established for. It is so auspicious to have the Kechara flag with the seed syllable BAM as its symbol or emblem. Any being who sees the seed syllable BAM each time the flag flutters in the winds, plants seed of enlightenment in its mind stream. Seeing one’s National flag flying gives one the sense of patriotism. However seeing the Kechara Flag flying gives rise to the feeling of “divine pride” that Kechara – A Tsem Rinpoche Organisation shall flourish forevermore! Thank You Rinpoche for designing this meaningful Kechara flag. When I read Rinpoche’s blog post above I see the importance of harmony between our vision and dreams with our local community and the larger society as a whole. For us to achieve the impact we aspire to have, we need to all work hand in hand. The flag of Kechara looks very clean and simple but hold such deep and vast significance. 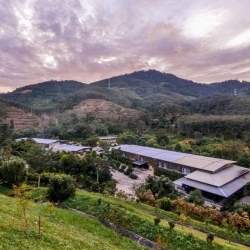 Having had the honor to live in Kechara Forest Retreat and share this space with participants of the Inner Peace Retreat, I can see how this is a space where people heal as our 4 elements finds harmony and balance. I can also see how this is the portal for us to entire Vajrayogini’s paradise as we work here to overcome our sources of suffering (3 poisons of ignorance, ego and anger) as we challenge ourselves out of our comfort zones. It is with great humility and gratitude that I say this: being in Kechara Forest Retreat where daily living is about being mindful, serving the community, giving back to Nature and reaching out to society, I believe I have a chance to transforming my mind to experience inner peace, happiness and contentment. The thought that we can create of heaven on earth becomes closer and more possible. Kechara Forest Retreat is tangible hope. Thank You for hoisting our Kechara flag together with those of Malaysia and Pahang. It is a sight to behold, seeing it fluttering in the wind, in front of Kechara Forest Retreat. Nay it be a sign of growth for all who enter Kechara Forest Retreat, Pahang and Malaysia. So happy to see Kechara flag flying on the earth of Malaysia…It represents the growth of Dharma in Malaysia . May everyone get the blessing and achieve the enlightenment . . Seeing the Kechara flag being flown with Malaysia’s flag and Pahang state flag mean a lot. It makes me feel that Kechara has grown a lot, reason being that it is usually organisations that have grown to a certain scale, then they will have their own flag design and have their flags being flown with the country’s flag and state flag. Having the Kechara flag being so high up on the flag poles marks a special significance as it indeed shown that Kechara has grown. And it is because of Rinpoche’s vision and the hard work of the students to have made this happen. Without Rinpoche, everything will not have happened. Although the flag may look very simple with the BAM letter and a white background, however the thought and meaning behind what Rinpoche has thought through is incredible. I feel so ignorant when I think about it. Indeed the meaning of the white background representing clean, clear, luminous mind is strong. And it is exactly why people join the dharma. As by the end of the day we want to have transformation in our minds. Being in Kechara and having our Dharma family’s support is the biggest support for us to have that clean, clear, and luminous mind. Showing that in KFR there will be no pollution, distortions nor projections that will “dirty” our mind. The Kechara flag is so simple yet it carries a remarkable significance to all who catch a glance of it. For those who know the meaning of this flag, it would serve as a reminder of their spiritual path which lead them to Vajrayogini’s paradise. Since it is the seed syllable of Vajrayogini’s mind on the Kechara flag, it is such a joy to note that everyone who sees it would be blessed and planted with the seed of enlightenment. Thank you Rinpoche for having this flag and Kechara Forest Retreat to guide all beings towards a clear, peaceful and happier mind which would eventually lead to their enlightenment. It is wonderful to see the Malaysian, Pahang and the newly designed flag of Kechara fluttering in the wind in front of the entrance of Kechara Forest Retreat. I really like the fact that despite the new Kechara flag having such a simple design, the meaning behind it has a very strong Dharmic meaning and symbolizes what we strive to achieve. 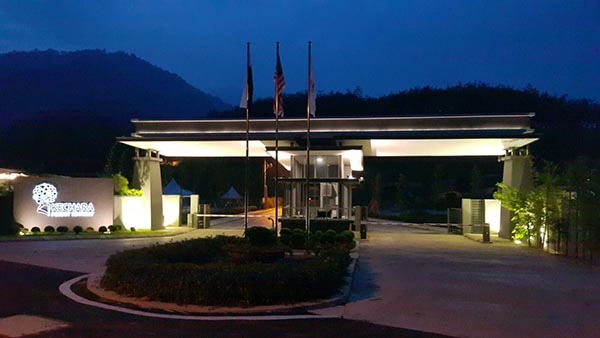 As a retreat center and tourist attraction, it is very good to have the Malaysian flag and the Pahang state flag in front of the entrance of Kechara Forest Retreat to show all passerby’s and vistors our loyalty, respect, appreciation and love towards our country and state. Thank you Rinpoche for taking the time to write this post and to explain the meaning behind Kechara’s new flag. May Kechara Forest Retreat continue to grow and expand so that everyone who visits can take a step back from the city and leave feeling blessed and recharged. It is good to know that KFR finally has the flag poles to hoist the flag which will show that we love and respect our country and state. The flag a real beauty to me and i am sure everyone else will see it as a beauty. I never knew the significance of the BAM symbol, but now I know the significance. 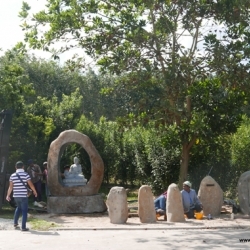 KFR is a really nice place to visit as, it is really peaceful and quiet compared to the city. KFR is not just a spiritual place, but also a place for nature lovers and people who want a break from the hectic city life. May Kechara keep growing and may our country and state always be peaceful and prosperous. Raising a flag is always auspicious and the display of pride and honour. In Kechara, we raised the flag of our nation symbolising how proud we are to be of Malaysian origin, the state flag in gratitude for the assistance by the state authorities and in respect of the space we are in. As a Kecharian, the flag of Kechara is a beauty to my eyes and with the meaning expounded by Rinpoche, it is heart warming that with the flying of our flag we are in a state of learning perfection in this life and future lives. 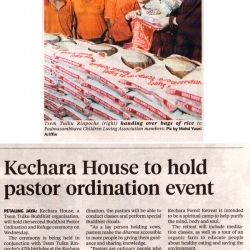 And also Kechara’s commitment to be a place of refuge for the well being of our state of mind. To be pure and clear with the blessings of Buddha Vajrayogini to achievement of peace and harmony within ourselves. It is a proud moment to have our flag flying with our national and state flags and extremely auspicious to have it raised for the first time on Malaysia Day 2015. May auspiciousness be for Malaysia, the state of Pahang and our organisation, Kechara House. Thank you for the explanation for the flags in front of Kechara Forest Retreat. There is really much thoughts placed when raising the flags in front of KFR. 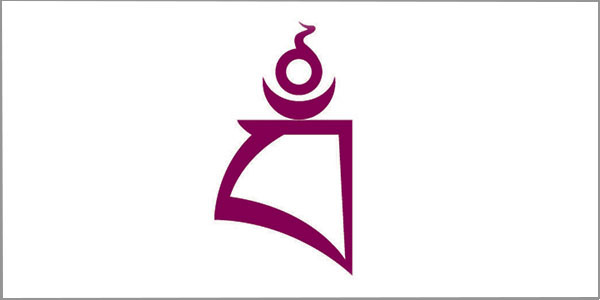 I never really give much thought on the BAM symbol, thank you Rinpoche for giving us such clear explanation on what the symbol represents and symbolises. Raising all 3 flags on Malaysia Day has so much meaning to it and shows how much love and respect we have for the country and the state. Thank you Rinpoche. Thank you Pastor Moh Mei for expediting the process to have the flags up in time. I rejoice to see the Malaysia, Pahang and Kechara flag at Kechara Forest Retreat raised up on Malaysia Day. This day also marks the first time we have our Kechara flag. It is indeed great blessings to have this BAM flag at the entrance of Kechara Forest Retreat as those coming to Kechara Forest Retreat or passing by will be blessed by Vajrayogini when they see the BAM sign. Thank you Rinpoche for this wonderful update, KFR is a very bless place to be this retreat center is suit all the city folk who load up with a lot of stress in the daily basis KFR is a place for all of us to distressed what more is a land that already been bless by many enlightened being once again thank you Rinpoche for having this retreat center in Malaysia. He is a living legend surrounded by those whose actions are legendary. You can be what you want to be and do what you want to do. The setting up of the 3 flags is really a symbolic moment for Kechara. I have seen how hard each and everyone work to get KFR up to where it is today. Without the hard work and our Guru vision… there be nothing like this that can benefit all in Pahang. Love the idea put in on the flag design. I was made to choose the colour to be used for the flag and was thinking only in the point of seeing like which looks nicer and did not gave much thoughts to what our Guru have thought of… wanting it to symbolise purity and clean mind and so on… really feel so ignorant when compare to my Guru. Thank u for making us all proud of being a Kecharian. We have our own flag for the first time and it means a lot to us Kecharians. 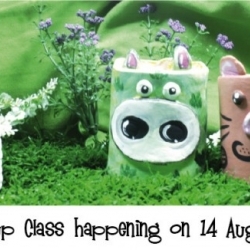 People come to Kechara with different goals, aspirations and motivations but mostly all we wish for is happiness. Happiness is a big word which need a lot of effort. 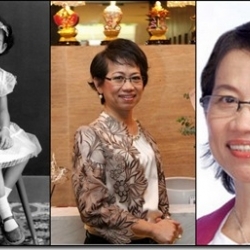 Here in Kechara we have a Guru who resides here to guide us to this path using different methods. Kechara flag may look simple yet it denotes the destination where we wish to arrive ultimately which is the abode of Vajrayogini where we can find permanent happiness. To reach Vajrayogini’s pure land we need an enlightened mind. To be enlightened we need to practice Dharma and transform our mind. All the teachings, practices, retreats and Dharma activities here we have in Kechara is to prepare and guide us to the path to enlightenment. Rinpoche is very compassionate and kind to use different methods to teach us Dharma for example by creating Kechara Forest Retreat (KFR) in Bentong that serves as a platform for us to serve Dharma. By having Kechara flag waving in the air, it serves as a reminder for us to practice Dharma more diligently in order to reach our goal. While having Malaysia and Pahang Flag shows how fortunate we are to be able to establish the pure Tsongkhapa lineage here on this beautiful multiracial country. It is really wonderful to see that the flags of Malaysia, Pahang State as well as Kechara are flying at the entrance of Kechara Forest Retreat. 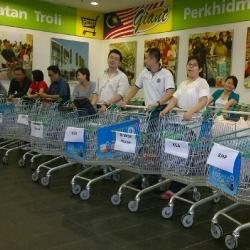 It is even auspicious that it is raised on the Malaysia Day! For me, this representing Kechara Forest Retreat respecting the nation & supporting the growth of Kechara, Pahang & Malaysia! It is just like the vision of Rinpoche that we are building a world peace centre for the benefit people of Malaysia & from Malaysia, to all in this region and to the world. From Rinpoche’s detailed explanation of the Kechara’s flag with the BAM letter that represented the mind of Vajrayogini, the mind of enlightenment, and the balance of the four elements within our body for peace, harmony and happiness, as well as a mind that’s luminous, clear and happy. Anyone who pass by or see the flag will get the blessings from Vajrayogini. 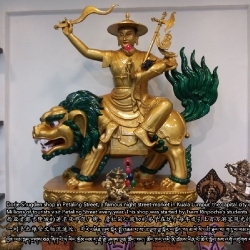 It is also representing Kechara is the portal for us to get the teaching and lineage of Vajrayogini, the powerful Buddha that will help us to get enlightenment in this era. May Kechara and Kechara Forest Retreat grow far & wide. May many more people can get to come and benefited from KFR! Thanks for the post. The 3 flags represent what Kechara Forest Retreat is; the country Malaysia, the state it is in, Pahang and Vajrayogini Paradise which Rinpoche has envisioned for us and make it manifest as KFR. The flags give a sense of recognition to the governments of the country and state with Kechara and the intimate connection with the people of Malaysia and Pahang. It shows that KFR officially recognise the land of Malaysia and Pahang which means respecting others is a value that is important to Kechara Forest Retreat. In return we will also be respected. 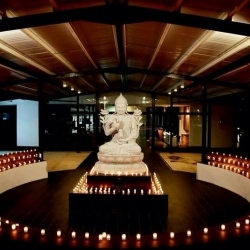 May all sentient beings benefit from Kechara Forest Retreat which is a portal to a divine state of mind, a portal to the abode of Vajrayogini, right here a pure land in the state of Pahang, Malaysia ! Thank you Rinpoche for conceptualizing and making it available for all of us ! It’s so great to see Malaysian flag, Pahang state flag and Kechara flag displayed at the entrance of Kechara Forest Retreat. Malaysia is not the richest, the wealthiest or the perfect country in the world, but we are lucky not to live in the conflict zone and still enjoy religious freedom under the law. Here in this land, I meet my Guru, follow the Gelug lineage and practice. I was not born in Pahang, but because of Kechara Forest Retreat, Pahang become my another home after my hometown and the town I work and live for so many years. Kechara is the last destination we all would like to ascend to – a mind that with no pollution, no distortions and no projections, a Vajrayogini’s mind, an enlightenment mind. Thank you Rinpoche for the teachings on the seed syllable BAM. May all beings walk pass and see the Kechara flag be blessed and experience happiness, peace and joyfulness in their mind. May many get the teachings and blessing of Vajrayogini and be freed from sufferings. May Vajrayogini’s teachings spread wide and far from here to the ten directions. Thank you for sharing this short yet very meaningful teaching based on our very owned Kechara flag waving which symbolizing that Kechara is being established here in Malaysia and Kechara is here to stay as an icon of Bentong, Pahang and Malaysia. I can’t help but feel sense of proud by just looking at the waving flags and very fortunate and grateful that i am part of this Dharma community and Dharma family. May the existence of Dharma and Kechara Forest Retreat may bring peace, prosperity and growth to all Malaysians and the country. Flags can stir patriotism, loyalty, pride and even feelings of love towards a country, person, clan and so forth. The Kechara Flag billowing in the wind, is something to be proud about, proud that we are part of something greater than ourselves, and that we wish to contribute towards the growth of Kechara to benefit the multitudes. The BAM on the Kechara flag is commonly associated with Vajrayogini’s seed syllable, and the secret of the BAM will all be revealed when we obtain the initiation in the Vajrayogini secert practice. Vajrayogini is known as the mother who give births to buddhas, so may everyone who sees the BAM symbol be blessed and plant seeds to do Vajrayogini’s practice in the near future. Thank you Rinpoche for the sharing on the flags in front of the entrance of KFR. I always feel grateful that i am able to know Rinpoche and know Kechara in Malaysia, the country where i born in. Many people need to travel a far, some even across the different continent just to learn dharma. Secondly i am very happy that KFR is located in Bentong, Pahang. Bentong is a very nice town to live in, with many nice scenery. Of course the Kechara flag is making me proud as a Kecharian. I am always near to the Vajrayogini lineage, and always create more affinity to Kechara. I hope that many people will get blessings from Vajrayogini and be reborn in Kechara Paradise, which is the ultimate goal in dharma practice. Seeing the flags fly in front of Kechara Forest Retreat during Malaysia Day was perfect because the flags represent our respect and love towards our country, state and our institution. Without the people, there will be no country, state or institution. In Kechara, we are taught to focus out to benefit others always. We are taught to not be afraid to learn regardless of our age, to think on a higher level, to be more kind, to be more compassionate, more efficient, and to take responsibility of our actions. In other words, to be a better human being that is driven by wisdom and kindness. The flags say it all. We coexist in peace and harmony embracing all our differences. 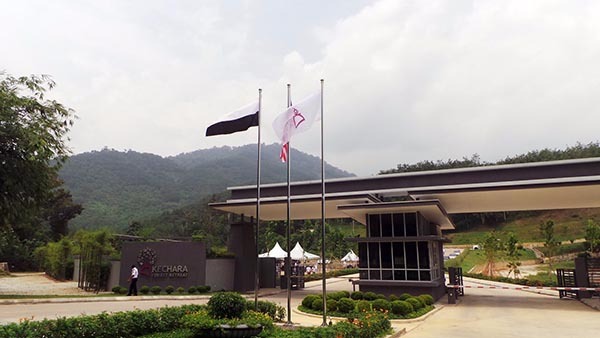 It is a great idea to erect the flags at entrance of Kechara Forest Retreat. To me the flags represent honouring and respecting the land we live on. We depend on the land for sustainance and growth. Every creature on land depends on it to live, so do the trees, and forests. To respect the land means we continue maintaining the land (environment) clean and habitable by human and animals, not plundering and destroying the land until it becomes a wasteland. It’s really nice to see the flags in front of Kechara Forest Retreat. The respect we show to the state and country is a reflection from the spiritual practice to benefit many people and directly to this beautiful country. Thank you Rinpoche for the detail explanation on the flags. It’s really a blessing for our Kechara flag. The significant from Rinpoche’s explanation is really wonderful and many people will be blessed by just seeing it. Kechara is definitely a place for our spiritual growth and in KFR it’s a place for many people learn and practice as a community. Thank you Rinpoche for sharing this article and the symbolism of the Kechara Flag. It will serve to remind everyone seeing this flag to practice to be one with Vajrayogini, but through the graduated path as propounded by Lama Tsongkhapa. And a reminder to all that we have to be thankful to everyone, our Guru, the Buddhas, the Sangha, country, state, friends and foes alike for they are our practice, our salvation. The three flag flying in the wind is a wonderful addition to Kechara Forest Retreat and to raise these flags on Malaysia Day is auspicious. Respecting the nation and state and its corresponding laws is in fact in accordance to the teachings of the Buddha. The nation is after all an agglomeration of all the people within it and Buddhism teaches that we should see all people and all sentient beings as our own family and to extend to them the love and kindness we give to our loved ones. For Kechara to raise these three flags is a strong statement, that is, Kechara is here to stay and the Lama is here to stay for the people of Malaysia. We do not have a visiting lama but a resident high lama who is committed to the people of Malaysia. This is good news for Buddhist in Malaysia for the authentic practices are now within reach, and this is also good news for the nation of people because there is now yet another organization to promote the all-important culture of peace and harmony between Malaysians of all races, religion and creed. On the extrinsic level, we are all citizens of Pahang, Malaysia and we abide by its laws and rules. On the intrinsic level, we are all residents of this pure land of Vajrayogini and KFR is nothing short of the gateway to Vajrayogini’s Paradise. May the presence of KFR in Pahang promote peace, growth and prosperity for all people in the State and the Country of Malaysia. I feel very touched seeing the Kechara flag being flown. I agree with Martin that it is a very strong statement, and I feel that is the reason why I feel so touched: Kechara is committed to be here to bring Dharma to the people in Malaysia. Even more importantly, this is the portal to Vajrayogini’s paradise, because the teachings of Vajrayogini is very sacred, rare, and difficult to access in this part of the world. Thank you Rinpoche for spending the time to design the flag, as well as giving us the explanation for the design of the flag. It is such a beautiful sight to watch Kechara flag flown along with our National and state flag on Malaysia Day. It is an expression of our identity and pride, based on Vajrayogini’s mind,the mind of enlightenment. Dear Rinpoche thank you for blessing fortunate Kecharians and visitors to Kechara Forest Retreat. With Rinpoche’s blessings and guidance may this heavenly place grow internationally for the benefit of other beings. May all beings,everywhere be happy and free and all my thoughts. words and actions contribute in some way to the happiness and freedom of all beings. With gratitude and folded hands, thank you for this beautiful post Rinpoche. A short but powerful teaching give by HE Tsem Rinpoche about the three flags at the front entrance to Kechara Forest Retreat. The tantric meaning behind the Kechara Flag is very impressive. Thank you Rinpoche for choosing such a powerful flag for Kechara. It is a blessing to see this flag on our way in and is very beneficial to practitioners. The Kechara Flag’s design was very clean, simple and yet very meaningful. I would like to work towards a happy mind, creating lots of merits so that i have the opportunity to enter Kechara Paradise. The Kechara flag will enable everyone who passed by, upson sighting the BUM, create the affinity with Vajrayogini, benefiting themselves so that in future they will too enter into the mandala of Vajrayogini. This is the skillful means and compassion by H.E. 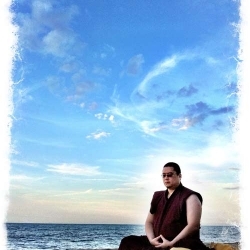 Tsem Rinpoche benefiting all being in KFR. I think it was a wonderful idea of having the flag poles and flag of Malaysia, the state Pahang and of Kechara as well. I love the symbolism of the Bam syllable and I think the flag itself is a powerful blessing to denote that Kechara Forest Retreat is within the dominion of Vajrayogini. It represents powerful blessings imparted on all people, animals and unseen beings who wander onto the sacred grounds of KFR. It signifies a lot to me and would seem like a victory banner proclaiming victory over selfishness, negative karma and obstacles. I rejoice with the erection of the flagpoles and I hope many who pass through the gates of KFR be blessed with the potential to receive her practice eventually, practiced her sadhana and 11 yogas, become a great Mahasiddha to benefit others and eventually ascend to Kechara Paradise. Thank you Rinpoche for this beautiful post. Thank you for the teaching on the Kechara flag and for reminding us to have respect and appreciation for our country and the state of Pahang, in which Kechara Forest Retreat resides. Thank you for creating the Kechara flag, which holds so much meaning(as Rinpoche’s teaching in this post has shown). The BAM, representing the enlightened mind of Vajrayogini and the luminous clear mind of enlightenment we seek to attain, is the symbol on the flag of Kechara. With folded hands, and heart filled with deep appreciation and gratitude, I thank Rinpoche for creating Kechara on earth, to give us a beautiful clear path of practice. Thank you Rinpoche for always being so thoughtful for our spiritual path. Everything Rinpoche does is for our spiritual benefits, even a small thing like a flag has got a profound meaning in it. It is not easy to get information on Vajrayogini practice because it is a secret practice, there are many things that cannot be revealed to a non-practitioner. But Rinpoche skilfully gives us bits and pieces of knowledge on Vajrayogini to create the cause for us to one day receive the the practice. Kechara Organisation is a platform Rinpoche creates for us to create the merits and purify our karmas for higher practice. Kechara Forest Retreat is the infrastructure Rinpoche creates for us to do the higher practice. I don’t know where else in this world we will be able to find a teacher and a place like this. In Kechara Organisation, there are many hidden treasures. 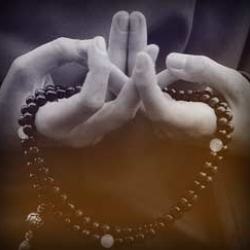 As we progress in our spiritual practice, we will be able to find them. The meaning behind the three great flags that hangs right in the front of sacred Kechara Forest Retreat is really beautiful and perfect. I like the creative rationale of the Kechara Flag and the significance of it all. And even for those who do not know the “real” meaning behind it, just from sight of it, they will be blessed and seeds of enlightenment imprinted in them without them realizing it. Yes some will not receive Vajrayogini empowerment now, but at least the seed is planted and in future lives it has the potential to arise again. I remembered Rinpoche told me the meaning behing Kechara’s Bam back in the days when we first started designing the Kechara’s logo which Rinpoche drew out on just a piece of paper… and I had Cynthia Lee to design it. That time Cynthia was not part of us but just my housemate lol. Who would have thought that designing a simple logo could gain her merits to be in Kechara today lol. Rinpoche explained something similar to this post so I would understand why this symbol was important, and now to see this beautiful flag raised up high is a proud, privileged moment for all Kecharians and especially those older students, I believe, who still have the merits to be here to witness this. Thank you Rinpoche for planting the seeds of Vajrayogini in all of us, including the animals, and even formless sentient beings, it benefits so many. Thank you Rinpoche for sharing about the meaning behind the beautiful BAM-letter flag of Kechara. Indeed, those who see the Kechara flag & visits Kechara, they are blessed with the seed of Vajrayogini and the essence of enlightenment. We are fortunate to have learnt more about BAM syllable representing Vajrayogini’s luminous mind, and may we (Kecharians) work hard towards the building of Kechara Forest Retreat, so that this physical portal can be a powerful place of study & practice of Vajrayogini’s path. How wonderful that on Malaysia Day, when we celebrate this beautiful country’s independence by proudly flying the Malaysian & state’s flag, we are also blessed with the flag of liberation of Buddha Vajrayogini. Hanging the flag up high is a respect to the country, the state and the temple. 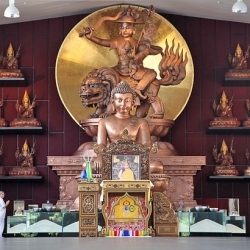 Kechara is located in Malaysia, the mission and the purpose of Kechara being in Malaysia is to benefit the people here and to benefit the people from around the world, everyone will be coming to Malaysia, to Pahang to visit Kechara and get blessing from the Precious Buddha – Vajrayogini, Lama Tsongkhapa and Protector Dorje Shugden. Thank you Rinpoche for bringing Kechara to Malaysia, for so many people to be able to get involve into self improvement and learn to give back, to give back to the society. Bentong, Pahang is a beautiful and quiet place to be, there are a lot of forest and hills, it is also where Kechara Forest Retreat is. I love to go there as the place is very serene and peace. Having the BAM flag outside of Kechara Forest Retreat is so blessed, everyone who goes in to the place, everyone who passed by going in to the waterfall, they will be blessed by Vajrayogini the moment they sees the flag of the seed syllable “BAM”. Thank you Rinpoche for the detail explanation. Proud to see these 3 flags are flapping in front of the beautiful place, Kechara Forest Retreat. After reading the explanation by Rinpoche, it’s even more meaningful. Thank you Rinpoche for setting up this paradise on this land, open up opportunities for the people in Malaysia to enter the pure land of Vajrayogini, which our mind dissolve into the eternity of happiness. Our mind and karma are the only baggage we bring to our next journey when this current body goes back to the earth, for me, our mind is worth “investing” for than expensive property, luxury car, and successful career. 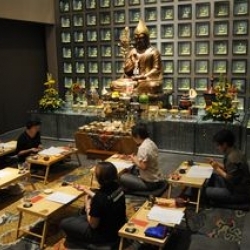 Kechara is a place to guide your mind to enlightenment. I am very grateful to meet and be part of Kechara, thanks to the hardworks from Rinpoche and his dedicated students who overcome so much obstacles to make this possible for me and so many people on this earth. May these 3 flags continue to flapping high, continue to give hope to sentient beings that achieving eternal happiness is possible. Thank you Rinpoche for the explanation on the symbol and may Rinpoche and all Gelug Lamas spread the Dharma as far and wholesome to benefit many. Kechara Forest Retreat is the portal of the female Buddha Vajrayogini whose state of mind we are trying to achieve. Kechara Forest Retreat is the paradise on earth conducive for us to learn, practise to achieve Vajrayogini. This is too awesome. Thank you Rinpoche for actualising this and offering this rare and precious opportunity to anyone who cares to be connected and make their wishes come true. Thank you Rinpoche for explanation of the Kechara flag . wonderful wishes from rinpoche i always respert my buddha dharma and shangha May Malaysia always grow, always be at peace, harmonious and prosperous. We wish the best to all our Malaysian people, the government and the public.thank you for your kind wish and share. Thank you for the detailed explanation of the Kechara flag and the meaning behind it. We are all extremely fortunate to have met Rinpoche, hence, to have the great merits to receive pure Dharma and to be in Rinpoche’s mandala. The Kechara Organisations with its vibrant activities online or offline, and especially the heavenly Kechara Forest Retreat will definitely benefit countless beings. May all who come into contact with Kechara receive the blessings of all the Buddhas, Bodhisattvas and the blessings of Mother Vajrayogini herself as Rinpoche mentioned.